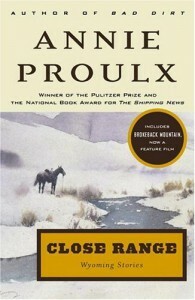 06/01/2009I started reading Close Range, the first of three collections of Wyoming stories written by Annie Proulx. I have had this book for several years and am just now getting around to reading it. Close Range consists of the following collection of short stories:The Half-Skinned SteerThe Mud BelowJob HistoryThe Blood BayPeople in Hell Just Want a Drink of WaterThe Bunchgrass Edge of the WorldPair a SpursA Lonely CoastThe Governors of Wyoming55 Miles to the Gas PumpBrokeback Mountain *****I started with Brokeback Mountain, a poignant, completely believable story of forbidden love. I haven't see the movie yet, and hope I am not disappointed by it when I get around to renting it.I have already read and thoroughly enjoyed Annie Proulx's second collection of Wyoming Stories entitled "Bad Dirt." I don't think it really matters the order in which one reads these collections of stories since there don't appear to be any "repeat" characters in all these beautifully written stories.In my reading queue and in my possession is the third collection of stories in this series, "Fine Just the Way It Is." It will be a lovely series of summer reading.